Today we have a wonderful review, interview, and giveaway all thanks to publisher Diversion Books and Jessica Kapp! We hope you enjoy this post as much as we liked creating it. I write under the name Jessica Kapp, which is a slight variation of my maiden name. I was born and raised in western Washington and traded in skyscrapers for wheat fields when I went off to college at Washington State University. Somehow I keep moving to places that are progressively smaller, because now I reside in a tiny farm town in southeastern Washington where there are quite possibly more cows than people. I’ve always loved writing—from the moment I could form sloppy sentences with my #2 pencil. But I remember distinctly in sixth grade that I wanted to be a writer. Then I took a broadcast class in high school and I opted for a career in TV land. News stories aren’t quite as fun as fiction though, and I eventually came back to my true love. When I landed my first magazine contract. I had to write a pitch for the story I wanted to tackle, and the editor loved it. The fact that someone liked my writing style and wanted to pay me to tell the story is when it really hit me. Do you work another job as well as your writing work? By day I’m a freelance news reporter. It’s great because I can work from home. I still write for magazines from time to time but mainly a local business paper. On occasion I’ll also moonlight at a local winery, pouring in the tasting room or helping with special events. BODY PARTS is about an orphaned teen waiting for a family only to learn she’s been raised for her organs. If I’m writing from one perspective, it takes me about three to four months, then another few months to edit. The dual perspective story I’m working on has taken me twice as long, and it’s still undergoing revisions. Definitely my dual perspective story. Getting the voices right and distinct is challenging. My passion is speculative fiction, but I do have a couple of contemporary stories in the hopper. I would love to continue the story! 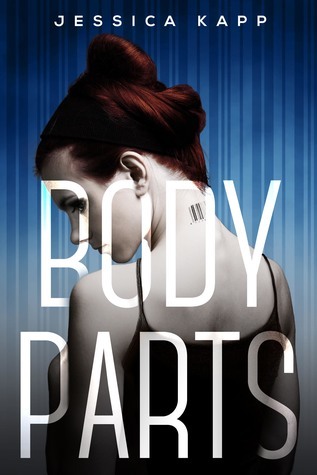 When I wrote BODY PARTS, I had an idea in mind should it ever evolve into a series. The plot is bouncing around in my brain, but for now, the story is a stand-alone. Everywhere. Literally. I can be waiting in line at the DMV or running on the treadmill or talking to a friend. Something will pop in my head—triggered by a scene or a word or just a random thought—and my mind will start pulling the idea together. I have a list of story ideas on a bulletin board in my office. Some are more developed while others are just a few lines/notes that I hope will turn into something great. First I check my email. Then I waste about 10 minutes on social media (who am I kidding, it’s probably more like 20). Then I check my email again. Only when all my messages have been checked do I finally open a Word document. I need complete silence to write. No music. No fan. No phone pinging. I’ve tried writing with songs playing in the background but it distracts me too much. I came up with the title early on and fully expected the publisher to change it as I’d heard that 99% of author-created titles didn’t stick during the road to publication. To my surprise, Body Parts did! But the credit for the beautiful cover design goes entirely to Diversion Books. They came up with the barcode idea on Tabitha’s neck to signify the fact that she was a commodity while giving it that futuristic feel. They did such a great job, adding smart subtleties on the cover to give the book its SciFi look while grabbing a reader’s attention! I’m a sequential writer, and I always come up with the title before I write a single word. The only exception is the book I finished at a retreat in June. It’s in the hands of a critique partner right now and it’s killing me that I still haven’t come up with a good title for it. A friend let me use the names of all her children for BODY PARTS. Paige and Meghan are twins in real life, although in the story they’re identical. I also own a Big Book of Baby Names and will consult it often. I love getting ideas from friends and family too. Unfortunately, I’m a terrible plotter. I try, but my characters never want to listen. They make unexpected choices that skew the storyline. They say things that change the tone. And the ripple effect from one character can throw my entire outline out the window. Flying by the seat of my pants is thrilling. The writing feels organic. I think I’m addicted to it. The story surprises me in unexpected ways. But the pain of revising because I’ve created serious plot holes is like coming down from a high. Each time I start a new novel, I tell myself to plot better. To stick to the outline. I have yet to do so. Sometimes I can’t get out of a scene, but in most cases (99% of the time) it’s because I don’t want to kill my darlings. I get so caught up in keeping a section or a line, I can’t move forward. I find that if I open a separate word document and paste parts I need to cut—for possible use later in the story—it helps me move on. Truth be told, I rarely use the parts I carve out, but that little trick at least helps me break through so I can keep writing. I play soccer every Monday night on a co-ed team. It’s a great outlet and my favorite way to exercise because I’m not thinking about the workout, I’m just playing. I used to play two nights a week but my kids are getting into sports and I’ve started coaching their teams (basketball and soccer). Oddly enough, coaching is a great way for me to decompress. It pulls me away from my fictional words so my brain can take a break. Yes. I’m working on a story now that’s inspired by a situation I dealt with as a teenager. As far as personalities, the characters might have a few traits from people I know in real life, but they really take shape on paper. Sometimes they surprise me! Did you have a favorite author as a child? I grew up on a healthy dose of Francine Pascal and Beverly Cleary, but it was Christopher Pike who took my love of reading to another level. I loved the way he twisted reality and made me question the world around me. I love book trailers! A good trailer can set the tone and pull in a reader who might be on the fence. Write every day. When you step away from your manuscript for too long, it’s so hard to get back in the flow of the story. Getting into a routine is key. I’m a night person, but if you need to wake up at 5 a.m. to write, do it! And find critique partners who will push you to keep going and offer you constructive feedback when you finish. I do. My married name is hard to say and people rarely spell it correctly. I figured it’d be better to have a name that was easy to say and quick to find in a Google search. If you could invite three favorite writers to dinner, who would you invite and enjoy chatting with? I’ve met Margaret Peterson Haddix, and she is such a lovely person! I enjoy her books and I’d love to spend more time chatting with her over dinner. Marie Lu would be on my invitation list. She’s such a gifted writer and I’d love to pick her brain about her creative process. I’d also invite Suzanne Young. I enjoy her writing style and would like to know more about how she comes up with her story ideas. I went back and forth on this one... As much as I enjoy paperbacks, hardbacks win by a slight edge. Books all the way. Then the movie—just to see if they followed the plot and what actors/actresses got cast as my favorite characters. It’s a tie between Romantic Comedies and Action movies. Both. If I like a book at the library, I usually buy it at the bookstore soon after. Late nights. I will never be a member of the #5amwritersclub. Coffee, but with an absurd amount of cream. So really, it’s just cream with a little coffee. Wine. I rarely drink pop. I do like beer but prefer wine. I’m lucky to be surrounded by a ton of wineries. Cats. But we have the most incredible Great Pyrenees. She’s the sweetest and I adore her!